The popular Aisu area of Ede in Osun State is not the typical place one would expect to find a National Youth Service Corps camp. The area popularly known as Country Home is defined by its fine architectural pieces and the calibre of people who live there. The serenity of the neighbourhood extends into the camp. The entrance is manned by soldiers and men of the National Security and Civil Defence Corps (NSCDC). Going past them means going past a barrage of questions and the responses must satisfy the interrogators. Inside, corps members decked in white shirts and shorts buzz about in an environment that bears more striking resemblance to a park than a camp kept with regimental precision. Everything looks clean here. It is in this space that soldiers drawn from the Nigerian Army’s Engineering Construction Regiment (ECR) drill 2,100 corps members called up for service in Osun State. Of these number, 788 are females while the remaining 1,322 are males. But beyond the early morning parades and obstacle courses the corps members have to undergo, Daily Trust observes that they also spend time in the Skill Acquisition and Entrepreneurship Development (SAED) centre on the camp. Each of them must learn at least one skill before leaving the camp. “We are training our corps members in Osun in such a way that they will not be job seekers after the service year. 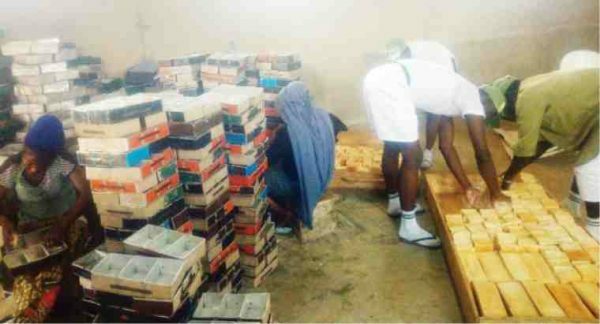 We are equipping them to be able to stand on their own and even become employers of labour,” the NYSC Coordinator in Osun State, Mr Emannuel Attah said. “There are various skills that can be learnt on the camp. We attach seriousness to this Skill Acquisition and Entrepreneurial Development (SAED) and I always encourage all our corps members to make good use of this great opportunity,” he added. One of the skill acquisition programme drawing a lot of attention is the gari production plant in the camp which produces the gari that corps members in the camp consume during their orientation programme. It is also used to train corps members in the gari production. “We are not buying gari from outside whenever we are in camp. We produce the gari that we consume. Corps members make the gari themselves. We also have a bakery where we are producing the bread that we eat on camp. So, we are not buying bread from outside. The corps members work in the bakery to produce the bread and that gives them the opportunity to learn how to bake bread,” he said. Another project of the camp is the ambitious just-concluded 16-bed health centre. The centre is supported by a pharmacy and laboratory and the coordinator is confident that the centre, built with self-help and support from friends of NYSC, will provide services not only to the camp but for the host community. This is still a tall dream though as the state government has not equipped the centre yet, something it had promised to do. But when it does become operation, whether the wealthy residents of Country Home would endure the security bottleneck to access medical care at the Osun NYSC camp is another issue. But this is not a major priority now for the corps members currently in the camp. For most of them, the camp has met and exceeded their expectations. Antai Peter is one of them. “It is fun. I’m indeed glad to be part of this camp. I feel like we should not leave this camp. I will miss the camp, my roommates and friends when we leave,” he said. This was re-echoed by Adeniji Kehinde Rachael. During his visit to the camp, the Director General of NYSC, Brig-Gen. Suleiman Kazaure was also impressed with what he saw. He commended the corps members for their good conduct and lauded the Osun NYSC coordinator and the entire staff of NYSC in the state. With this batch ready to leave camp and serve in various parts of Osun State, from the smiles on their faces, it is clear they will be taking fond memories of the camp wherever they are posted to.